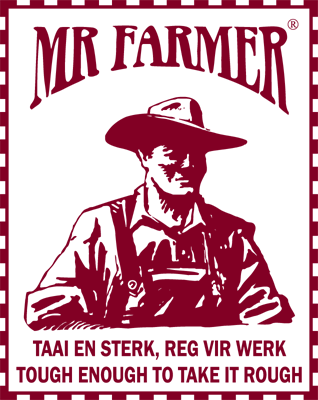 Mr Farmer currently only delivers within South Africa. Please note that we offer free delivery to most of the Western Cape and once payment is received you will be notified of a delivery date. If your delivery address does not fall into our free delivery category a delivery fee will reflect on your quote. Should you prefer to use your own courier service you are welcome to inform us. The estimated delivery time is from the date of payment confirmation of your order. Some delivery times may be longer during periods of high demand. Please take into account Mr Farmer does not deliver on weekends or public holidays. Mr Farmer cannot guarantee delivery within the timescales where circumstances beyond our control, such as extreme weather, prevent the postal service or relevant carrier from being able to make the delivery. Mr Farmer shall not be held be liable to you for any losses, liabilities, costs, damages, charges or expenses arising out of late delivery. Mr Farmer will endeavour to advise you of any delays relating to your order. You can return an order 30 days from the purchase date, as long as your purchase still has all the tags and is in its original condition. This means that the product should not be damaged, dirty, marked and has not been worn. You will be liable for the cost of any returns made due to exchanges, whether it be returned with your own courier, or Mr Farmer could quote you on the collection of the returning products. Only once payment is received for the returns, will the collection be arranged. Cash back returns are to be returned at your own cost within 7 days of receiving your order. A size or colour swop can be done within 14 days of receiving your order. If you have received a product which turns out to be defective or otherwise of poor quality, please notify us as soon as reasonably possible after you become aware of the defect or poor quality, but in any event within 1 month after delivery / collection of the product. We will arrange to collect the product from you at no charge. Once we have inspected the product and validated your return, we will at your choice repair / replace the product (if such repair is possible / we have the same product in stock to use as a replacement) or credit your account with the purchase price of the product (or refund you if that is your preference). If the repair / replacement takes longer than 21 days, we will get in touch with you to see if you would rather receive a credit / refund. If you return a product to us, but you fail to return all of the accessories and parts that were sold with that product, Mr Farmer is entitled to (subject to applicable law) to refuse the return, only to replace the item that you did return, or to estimate the value of the missing accessories and parts and only to credit or refund you in respect of the returned item. It is your sole responsibility to ensure that any products ordered from Mr Farmer are sufficient and suitable for your purposes. Mr Farmer does not warrant that Mr Farmer products will meet your individual requirements, nor does Mr Farmer warrant that they will be fit for your individual purposes. Mr Farmer products are designed as standard for the purposes described and are not tailor-made to individual requirements. Mr Farmer reserves the right to change the price of any product prior to our acceptance of your order. In the event that there is any change in the price of any product ordered by you, Mr Farmer will contact you to confirm that you wish to proceed at the amended price. Products may vary slightly in terms of specified colours, designs, dimensions, materials, measurements and other features to the extent that such variances are reasonable. We protect your personal information. We ensure that all information collected will be safely and securely stored.